Let’s face it, as FEA engineers we’ve all been in that situation where the finite element model has been prepared, boundary conditions have been checked and the model has been solved, but then it comes time to investigate the results. It’s not unusual on a large project to produce different outputs for different purposes: an XDB or OP2 for Patran, a Punch file to pass to Excel, and the f06 to read the printed output. In addition, your company may have programs that read one of these files to perform special purpose calculations. Managing all these files becomes a project of its own. Well let me tell you, there is a better way to do this!! As a premier FEA solver that is widely used by the Aerospace and Automotive industries, MSC Nastran now takes advantage of the HDF5 file to manage and store your FEA data. This can simplify your post processing tasks and make data management much easier and simpler (see below). So what is HDF5? It is an open source file format, data model, and library developed by the HDF Group. 1) The HDF5 file is smaller than XDB and OP2, 2) accessing results is significantly faster with HDF5, and 3) the input and output datablocks are stored in a single, high precision file. With input and output in the same file, you eliminate confusion and potential errors keeping the input BDF with its associated output. In addition, you can minimize output to the f06 file, so it will be smaller as you only need warnings and errors. This means you gain better traceability in comparison to using xdb and op2. It’s as simple as it gets! HDF5 is designed for storing and managing large and complex data. It can be used in any field: biology, physics, and of course engineering. The HD in HDF stands for “hierarchical data format”. The hierarchical format is designed to manage all sorts of data objects including tabular data, graphs, images, and documents. Implementing HDF5 in MSC Nastran has been an ongoing project that began with the 2016 release. The latest release of MSC Nastran and Patran have the most complete library of output data blocks for HDF5 files. Some examples include: nonlinear results, optimization results, fatigue life and damage results and rotordynamics results. MSC continues to extend HDF5 coverage with each new release of our software. 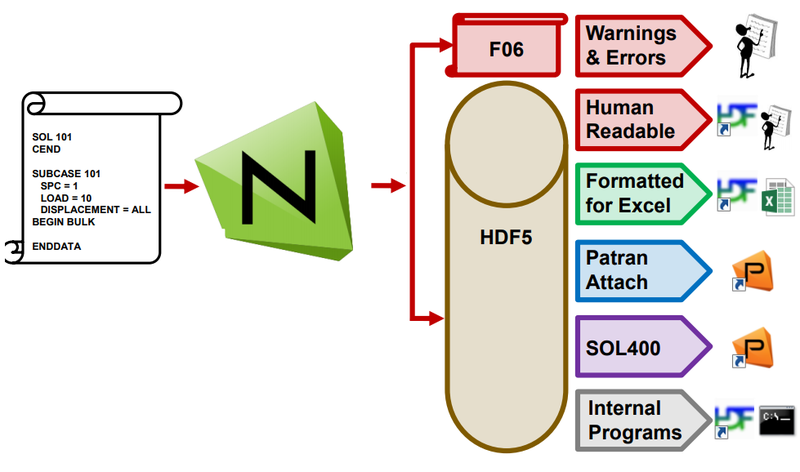 The HDF5 file produced by MSC Nastran is a binary file and the fastest way to access results in Patran. It definitely improves ‘Results Attach’ performance, especially when using large models with a million degrees of freedom. Although HDF5 is a binary file, you can use the HDFView tool to view your MSC Nastran data in a browser. 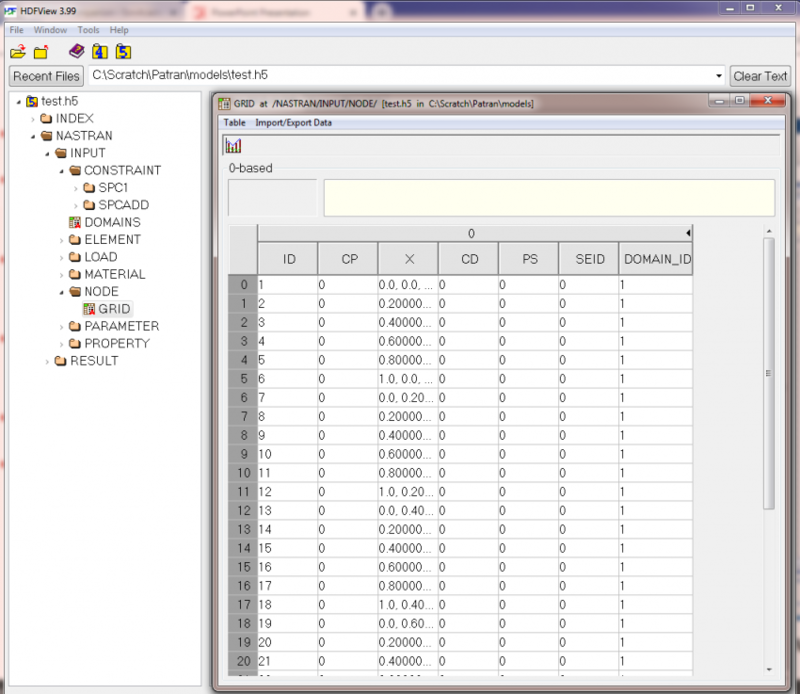 In addition, you can copy and paste data from HDFView to other applications like Excel, or export a data table or a csv format for plotting purposes. HDF5 data can be accessed with a variety of programing languages. The HDF Group provides native bindings for C/C++, Fortran, and Java. Third party extensions are available for Python, .Net, and many other languages. MSC provides HDF5 examples in C++, Python and Java. In addition, for those writing DMAP Alters, the new DMAP modules for writing HDF5 files are documented for your use. One of the nice things about HDF files is that you don’t need a lot of documentation to know what’s in it … The HDF5 file is self-describing! It’s easy to figure out what information is stored; just open and view the hierarchy with HDFView. In addition, MSC delivers the schema definition with each release. Which one would you rather use to manage your MSC Nastran output data? Whether you deal with small or large scaled MSC Nastran models, HDF5 output within MSC Nastran is the ideal choice for analyzing your complex FEA models, so do take advantage of it.